Lucette Lagnado wrote an interesting front page article for the February 19, 2010 Wall Street Journal titled After the Bubble, Beauty Is But Fleeting for Greenspan Portraits about the bear market conditions for artist Erin Crowe’s paintings of Alan Greenspan, the former chairman of the Federal Reserve. In the late 1990’s and into the mid 2000’s, while Wall Street was flush with cash, the art market boomed. During this time central bankers were considered rockstars and none was bigger than Mr. Greenspan. 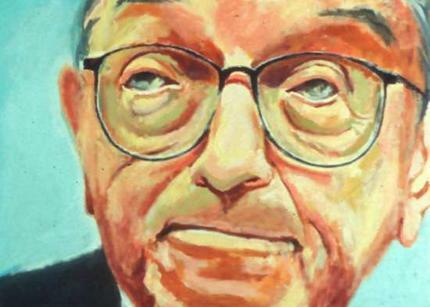 Erin Crowe was a young artist who strangely chose Greenspan as her muse. Here’s a short 2006 New York Magazine interview that explains her inspiration. In 2006, one collector dropped over $150,000 for a Crowe Greenspan and in the spirit of philanthropy produced 100 high quality prints to benefit a favorite charity. Sadly, today the painting is stuffed under his bed and not a single print has sold. This investment in the Greenspan era seems to gone the way of many American’s retirement savings. Well, this is a leadership blog so it got me to thinking about the similarities between art and leadership. Leadership, like art and beauty, is always in the eye of the beholder. Politics offers the best example. Some people are passionate about Palin while other prefer Obama. The viewer is to art as the follower is to the leader. Leadership and art can both be transitory and fleeting. Crowe’s Greenspan paintings and Obama’s approval ratings cover this one. Artists and leaders are visionary. They take risks and are often well “ahead of the curve.” The Cubists charted a course to break away from traditional figurative painting. Apple tried to sell us the Newton before the iPhone and much anticipated iPad. Both demand a combination of natural ability and practice. Following the nature vs. nurture argument, both art and leadership can be difficult, but not impossible, to teach. Finally, art and leadership are often very difficult to explain. Good luck trying to explain a Chris Burden to your great uncle Bill or Obama’s health care policy to nearly anyone. So I’m even more convinced that leadership is an art while management is a science but we’ll leave that post until another day. Tagged with Alan Greenspan, art, Erin Crowe, leadership, Wall Street.